You can fly your DNA to the moon by donating $10,000 to Omega Envoy's private moon mission. Lunar fans stuck on Earth no longer have to settle for listening to Frank Sinatra sing "Fly Me to the Moon" for the umpteenth time — a Google Lunar X Prize team has promised to send anyone's DNA to the moon in exchange for a $10,000 online donation. The chance to take one small step in space for family lineage comes from the Omega Envoy team — one of many competitors racing to land a robot on the moon in the $30 million Google Lunar X Prize. Any DNA samples tagging along for the ride would launch to the moon with the mission scheduled for December 2014. "It's a little like a lunar burial … but not as depressing," Omega Envoy said on the crowd-funding website Kickstarter. "Imagine looking up at the moon, and knowing a little piece of you is up there… and it will still be up there after the human race is long gone!" The Florida students who make up the Omega Envoy team are competing to win part of the $30 million up for grabs in the Google Lunar X Prize. 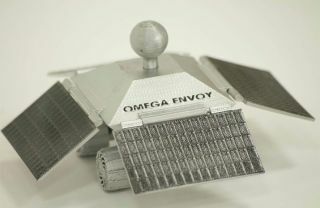 Omega Envoy has already won a NASA contract that could be worth up to $10 million for reporting back data on its lunar mission. But it has looked to Kickstarter's online donors for help raising $200,000 to make the mission possible in the first place. The $200,000 would help the team buy a CNC milling machine, a machine tool that is able to create real spacecraft parts from computer designs. A 3D printer on loan from a company called Stratasys has already allowed Omega Envoy to build prototypes of its spacecraft and lunar rover. Donating $10,000 for a shot at sending your DNA to the moon comes with a few buyer warnings. First, the donation only goes through if the Kickstarter project hits the funding goal by the set date of July 26; otherwise, all the donations are returned.. Second, space travel is always has risks. Donors would effectively be betting on Omega Envoy's success in successfully launching the mission and reaching the lunar surface intact. On the flipside, Kickstarter is not a website for making risky investments — it's about donating money to help causes that you believe in. That mindset may work best for anyone looking to help Omega Envoy get off the ground.